Caramel apples are one of those things that are as much fun to make as they are to eat. Perhaps because there's an endless variety of ways to make them, and so many different types of fun goodies to add to the outside. For our Halloween party this year I'm having a Caramel Apple Bar for dessert. I think everyone will enjoy decorating their own caramel apple with a variety of choices of melted orange, white, and milk chocolate, nuts, crushed butterfingers and toffee bits, mini M&M's, sprinkles, and chocolate monster eyes (you'll find chocolate monster eyes with the cake decorating supplies) - the options are limitless. Step 1: Assemble the ingredients. When it comes to caramel everyone has their own preference from using caramel bits or wrapped caramels to making it from scratch. Honestly, my preference is a caramel loaf of high quality, ready-to-use melting caramel. 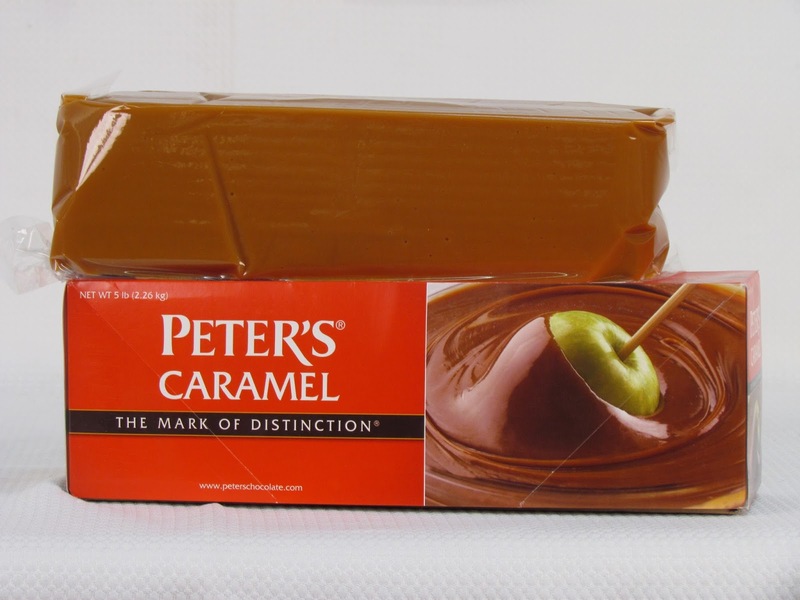 I use Peter's Caramel that I purchase from a kitchen/bakery supply store like Orson Gygi, but if you Google "Peter's Caramel" you'll see that you can find it at several different places. Chocolate wafers for melting is my preference. Some people use baking chips. For these lacy apples we're using three different chocolates: white, milk, and dark. Three small plastic bottles with small tips. (Or you can use a fork to drizzle the chocolate). I prefer using round lollipop sticks, but you can use popsicle sticks. Step 2. Prepare the apples. You need firm, crisp apples. If possible, buy apples that aren't waxed. The wax will keep the caramel from sticking. Wash your apples well. Dry them thoroughly and remove the stems. Step 3. Prepare the sticks. It's easy to add a touch of class to the look of your apples simply by dressing up the sticks. Using crafting tape (like Washi Tape) you can add a seasonal flair with a holiday-specific tape, or personalize it with a tape for a baby shower, birthday party, etc. Beginning at the top of the flat end of the stick place the tape at an angle, twirl the stick with the fingers of one hand while allowing the tape to glide through the fingers of your other hand securing it to the stick. Leave a space about an inch at the pointed end of the stick. You want to leave enough space to insert the stick into the apple without any tape. The process only takes seconds per stick and they look fantastic! Insert a stick into the stem end of an apple--about 3/4 of an inch so that they are in there firmly. Refrigerate the apples. This will make the caramel harden faster. Step 4. Melt the caramel. I like to melt the caramel in a slow cooker. It takes longer to melt, but the caramel can be kept warm for an extended period of time. The caramel melts gently on the high setting and can be kept melted on the warm setting for 1-2 hours. This is very convenient if you'll be dipping a lot of apples or want to do this for a party activity. To soften the caramel, add 1/2 to 1 tsp. evaporated milk to 1 lb. of caramel. 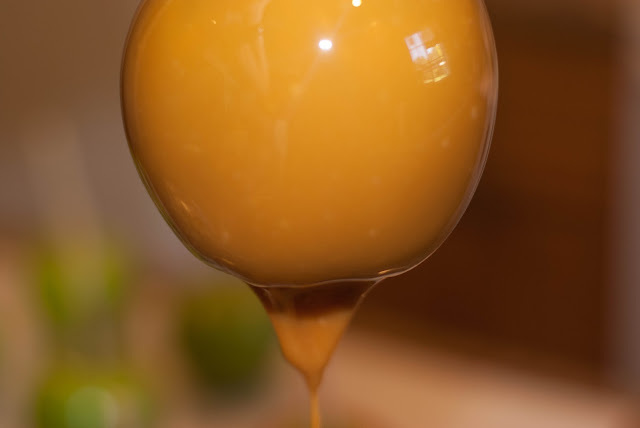 To thicken caramel, add 1/2 to 1 oz. confectioners' sugar to 1 lb. caramel. With Peter's Caramel, I've never had to thicken it. Maintain caramel in the 160-180 degree F range. Be careful not to let it scorch, and if it begins to thicken the heat is getting too low. While the caramel is melting, I prepare the sticks and the apples. Step 5. Dip the apples in caramel. Completely coat the apple with caramel (including pierce point) to obtain maximum shelf life. You can spoon some of the caramel on, too. Lift the apple out of the caramel and let the excess drip off. I scrape the bottom with a knife or spoon. Place apple onto parchment paper. For fastest set up and to minimize "bun feet", refrigerate apples after dipping for 15 minutes, or until the caramel is set. If you're adding nuts (or other toppings) you need to let your caramel cool, then roll the apple in your nuts and other toppings while the caramel is still soft. Step 6. Drizzle with chocolate. Melt the chocolate wafers in the microwave on high for 1 minute. Stir. Continue microwaving for 30 second intervals at 50% power, stirring well after each interval until melted. Be careful not to scorch. After you melt your chocolate, pour it into your bottle. I prefer using a bottle over a fork because I have more control with the chocolate, and while I'm not using the bottles I keep them in warm water to keep the chocolate soft. Otherwise, you're constantly having to re-heat it. For a pretty lacy look, drizzle the milk chocolate back and forth in the same direction around the entire apple. This is a quick, fluid motion. No need to be too careful. Next, do the same with the dark chocolate in the opposite direction. Lastly, drizzle the white chocolate in an opposite direction. Again, when you're not using a bottle of chocolate, keep it in the warm bath water and exchange the water frequently as it cools. The key to keeping the chocolate flowing smoothly is keeping it melted. If necessary, reheat it in the microwave. 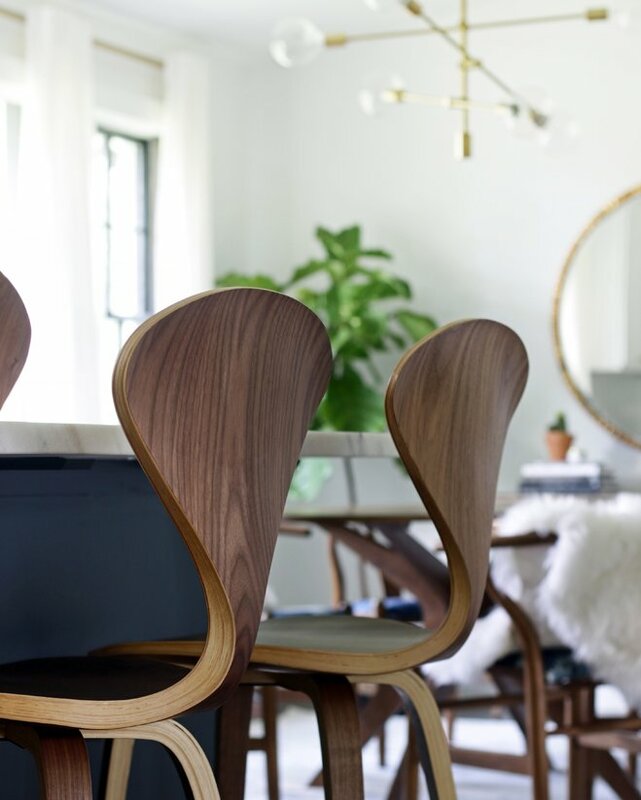 Tip: How to store your caramel apples. Store your finished apples uncovered in the fridge. Or, you can wrap each of them individually in cellophane bags. If you bag them up, don't store them in the fridge; if you do, there will be condensation inside the bag. The apples will keep several days in bags at room temperature. What is your favorite caramel apple topping?